Replacing your old ground cables is a prime example of one of the best preventative-to-cost ratio maintenance you can do for yourself and your e30. Why? Because if your body to oil pan ground goes out, your starter wont turn and you will be forced to push start or tow your car, and then you will waste a bunch of time and money thinking if it’s the starter that’s bad, or just on plain diagnostics. I had a ground cable that looked and felt completely intact, but after 22 years trust me it wasn’t grounding anymore, just one day out of the blue at a home depot parking lot it stopped grounding. Luckily I could push start it to get myself home. Another symptom you will most likely notice before it stops grounding all together, or after it has stopped grounding is when your e30 is running, the temp gauge will jump around erratically, one second it will be past the red mark on the very left then it will jump back to the middle, then back again, just generally all over the place. Don’t worry the gauge is just reading incorrectly, your car isn’t / hasn’t overheated. After replacing the ground cable you will instantly notice that your car cranks significantly stronger just by the sheer ability for the starter to fully ground. Find jumper cables then take the negative clamps and clamp one end onto your oil drain plug and the other end onto your steering rack, if the car turns over great then its definitely your ground cable, but again even if it isn’t your problem I suggest replacing it anyways after this many years. 12-52-1-285-011 Alternator ground cable, however I used this to ground the a/c compressor to engine block. 12-52-1-312-124 Alternator ground cable (red). 12-51-1-714-039 Engine to frame rail ground. 65-31-1-286-069 Rocker cover ground, however I used 12-42-7-551-714 off an e9x instead because of the factory 90* bend. Also it’s much nicer looking =). 12-61-1-311-511 Oil level sensor ground. This mounts to the oil pan, which simulates the oil level since our cars don’t have a sensor. (for m3/s14 guys). 65-31-9-055-973 Radio anti-interference ground strap. 12-42-7-551-714 off an e9x that i used as a rocker cover ground instead of the ugly 65-31-1-286-069 cable. 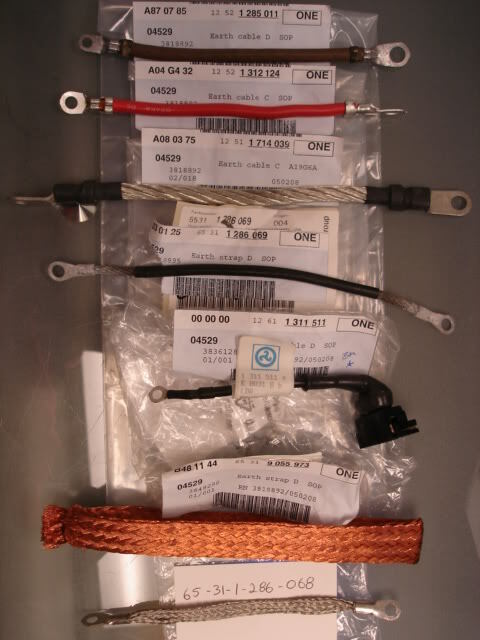 Remember the easiest way to pinpoint where all these ground wires go is to go onto www.realoem.com and search the part number. Thank me later! This entry was posted on December 7, 2010 at 9:41 pm and is filed under Do it Yourself. You can follow any responses to this entry through the RSS 2.0 feed. where is radio anti-interference ground strap located? Thanks, the swell could be due to a dirty potentiometer if you are using a stock radio. The radio uses the body to hood ground to reduce interference and static. Open your hood and look by the hinges, to the left of the hinges, you will find the ground strap that you need to replace. If you are talking about the other ground, the one your starter uses to ground to the body, then look from the drivers side (LHD car) below the airbox; you will find the ground is beside the power steering fluid lines and the other end connects to the top lip of the oil pan. Which ground wire connects to ingition coil?